Almost everyone has heard of the ancient civilization of Urartu, at least has done so during History classes at school. This state flourished far back in the 8th century B.C. This was the period when in ancient Greece there prevailed subsistence farming and towns and cities just started to take shape, whereas the Roman Empire lay centuries ahead. Urartu kingdom occupied the vast upland region between Asia Minor, Iran and Northern Mesopotamia, in other words the area of today's Armenia which at present borders Georgia, Azerbaijan, Iran and Turkey. Armenia is a mountainous country. It occupies the Armenian Plateau surrounded by the 3000 - 4000-meter-high ranges of the Lesser Caucasus. The topography of the region is full of contrasts: black earth plains and precipices, hot semi-deserts and eternal snows of the mountaintops. One might travel for hours along the bottom of narrow canyons and never guess that there are large plateaus above. Even in the years of ample precipitation, the landscape of the region looks dry due to the porous tuff soil which absorbs much water. There are a lot of the places where only prickly bushes grow; and bare fields of clinker are not uncommon. But the mountain foothills are full of springs. Though the region lies at the latitude of Southern Italy, its climate is far from being subtropical: the summer is cool, the winter is frosty. Only at a lower level down south, in the Ararat Valley, the climate is milder and steadier. Armenia is a small country that has a long history. The following are just a few of its historical landmarks. In the 6th century B.C. Armenia became a part of Persian Empire of the Akhemenid dynasty. After Alexander the Great smashed the Persians, Armenia became independent, but only for a short time. In the 3rd century B.C. the country was annexed to the state of Selevkid dynasty, the descendents of a Macedonian military leader. Such a variable fate of the Armenian people can be traced throughout their whole history. Thus in the 2nd century B.C. an independent Armenian state called Great Armenia was founded, but a few centuries later it was split between Byzantium and Iran; in the late-7th century A.D. it was conquered by the Arabs. Following the anti-Arabian uprising in the 9th century, the Armenian dynasty of Bagratids came to power. But later, from the 11th through 18th centuries, Armenia was repeatedly invaded by the hordes of the Seljuks, Mongols, and Egyptian Mameluks, by Turkish and Iranian armies, by Tamerlane's troops. 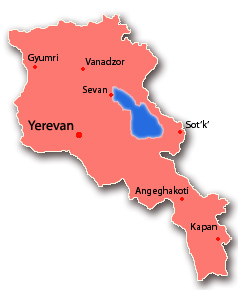 In 1828, after Russian-Iranian war, Eastern Armenia with its capital Erevan joined Russia. After the October Revolution, in 1920, the Armenian Soviet Socialist Republic (the Armenian SSR) was founded within the Transcaucasian Federation. In 1936 the Armenian SSR became the republic of the USSR. On September 23rd, 1991, Armenia proclaimed its independence. Few of the present-day states can boast of having a developed civilization as far back as the 1st millennium B.C. The most ancient monuments in Armenia date back to the times of Urartu kingdom. The architecture of the kingdom was highly developed. The gable-roofed temple with a pediment and facade columns in the town of Musasir was most likely a prototype of Greek temples. Archeological excavations revealed lots of artifacts, which once were the facade and interior decoration of the temple. Among them were bronze statues of winged bulls, rich thrones of the kings of Urartu, delicate shields. In ancient times and later in the Middle Ages one of the main routes of the Great Silk Road ran through Armenia. It led to Georgia, to the seaports of Poti and Batumi, and further up to the Mediterranean. 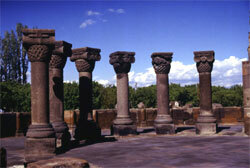 Armenian land can boast of many ancient monuments. 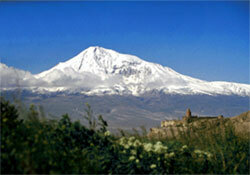 Its main sights are in the country's capital Erevan, one of the oldest towns of the world. It must be noted that in 301 Armenia was the first to officially adopt Christianity and has retained it since then. 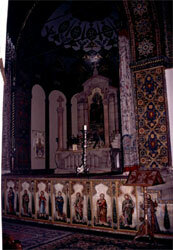 Therefore, one can find here mostly Christian temples, cathedrals and churches. Ancient towns used to start growing from a fortress. That is why the ruins of Erebuni fortress, built in the 8th century B.C. by the king Argishti the First in 20 kilometers from today's Erevan, is as a rule a starting point of a tour round the city. Garni pagan temple of the Sun, which has preserved from the remote ages, used to serve as a summer residence of Armenian kings from the 3rd century B.C. till the 4th century A.D. The impressive ruins of this temple invariably attract thousands of tourists. 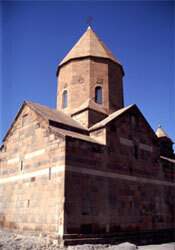 Echmiadzin Cathedral, dating back to the 4th century, is one of the earliest Christian cult buildings. It is "the heart of Armenia", the center of the Armenian Gregorian Church, the residence of the Catholicos - the Patriarch of all the Armenians. The temple of Zvartnots, which dates back to the 7th century, is the masterpiece of Armenian architecture. It is of a three-tier polyhedron shape and is 49 meters high. The temple has preserved its magnificent beauty despite numerous earthquakes. 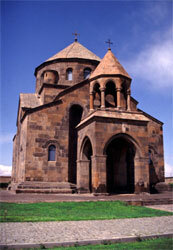 The monastery of Gekhard, built inside a rock, is a marvelous piece of the medieval Armenian architecture. The construction has two dead-end tunnels cut in a rocky mountain, with two churches at the end of them. Today's Erevan is one of the most beautiful cities in the Caucasus. From the streets of the city one can see the 4000-meter-high snow-capped volcano Aragats. The world-famous astrophysical observatory is located right here, at the foot of Aragats Mountain, in the village of Byurakan. It is Aragats that gives the best Erevan's buildings the pinkish and violet color combination: those buildings are made from the famous volcanic tuff quarried at the foothills of the mountain. Many-colored city's architecture with lots of stone carvings, green parks and gardens, decorative sculptures on the squares, fountains and ponds - all this make Erevan look unique and very attractive. One of the most remarkable Erevan's attractions is Matenadaran - the world-biggest depositaries of ancient manuscripts, the pride of Armenian culture. The depositary holds over 11000 manuscripts on various fields of human knowledge. 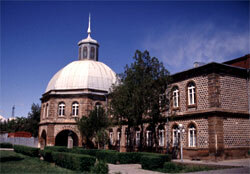 Erevan has 11 institutions of higher education and a university. There are 9 theatres and 21 museums in the city. The number of the museums proves that the Armenians have a truly long and eventful history. The natural gem of the region is undoubtedly the Sevan Lake. It lies at an altitude of about 2000 meters; its area is almost 1500 square meters. The lake's soft turquoise waters are not stagnant; they feed the Razdan River flowing out into the picturesque canyon Arzni. Arzni is one of the most popular resorts in the region. Another resort, called Jermuk, is famous for its mineral water. There are a lot of places of preserved natural environment in Armenia to be visited by a tourist: the Sevan National Park of about 5000 square kilometers in area; Dilijan - one of the best Armenian resorts with mineral springs and wonderful sceneries of mountains covered with forests; the town of Tsakhkadzor on the Marmarik River, where all the necessary facilities for holiday-making and sports are made available. The environs of the town of Goris attract tourists by the fantastic landscape of natural obelisks, which looks like a landscape of unknown planets in pictures by sci-fi artists. And the Biblical Ararat! Though the mountain is in Turkey, it can be seen from Armenia - from the monastery complex of Hor-Virap, a place of pilgrimage and certain tourist attraction. 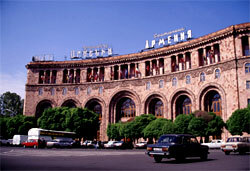 Armenia is both an industrial and agricultural country. It has developed machine-building, metal-working, chemical, petrochemical, non-ferrous metallurgy and other industries. Among the natural resources developed in the country there is copper, gold, iron ore, molybdenum, marble, tuff, dolomite, obsidian. In agriculture of the country a special place should be given to viniculture which allows the Armenians to make first-class wines and famous Armenian cognacs. Armenian stock-raising specializes in cattle and sheep breeding. Today Armenia is a secular independent law-regulated state, oriented towards democracy. The Armenians have withstood the test of time. This ancient nation has been going through many hardships and firmly continues to strive for prosperity.